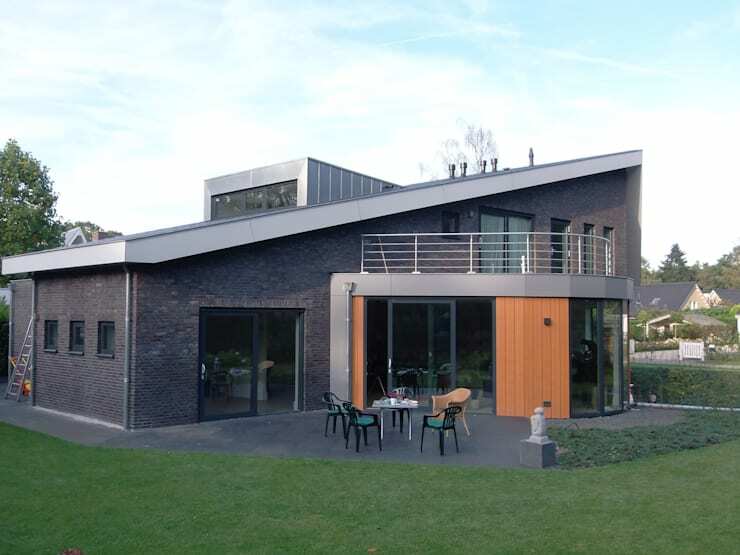 Situated in the municipality of Hattem in Netherlands, this villa was built with a lot of creativity by the architects at IR. G. Van Der Veen Architect BNA. A minimalist and simple street view of the house leads you to the surprisingly expansive backside and spacious interiors. 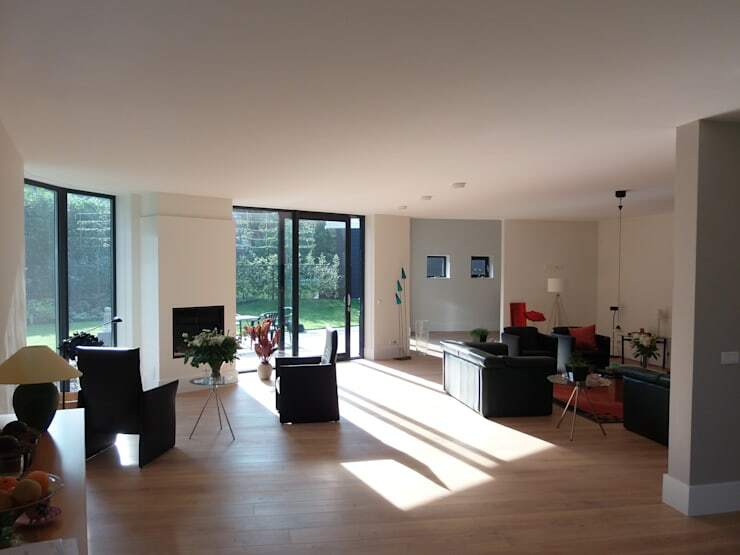 The villa comprises of a basement and two more levels, and uses glass cleverly to bring in adequate sunlight. The insides are roomy, airy, well-lit and very stylish as well. You also get to admire the beauty of the outdoors through the numerous glass windows dotting the building. When viewed from the street, the villa looks simple, compact and contemporary but not unique. 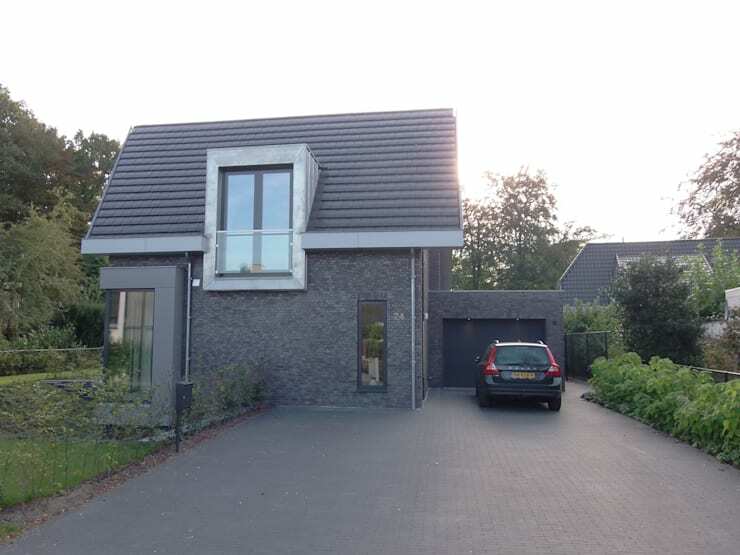 A generously wide and paved driveway takes you to the modern garage, while the house impresses with its grey stone walls and quaint sloping roof. Tall glass windows punctuate the facade to allow the sufficient influx of sunlight. What a surprise! The backside is a lavish and expansive affair, with a quirkily slanting roof and a curved projection. Who would have thought that such a simple facade could conceal such a stunning backyard? Wooden planks add personality to the curved volume, while large glass windows allow the interiors to stay well-lit and ventilated. The terrace on the upper storey comes with sleek steel railing and is a stylish touch for the building. Both the terrace and patio allow you to indulge in outdoor pleasures amidst manicured green lawns. 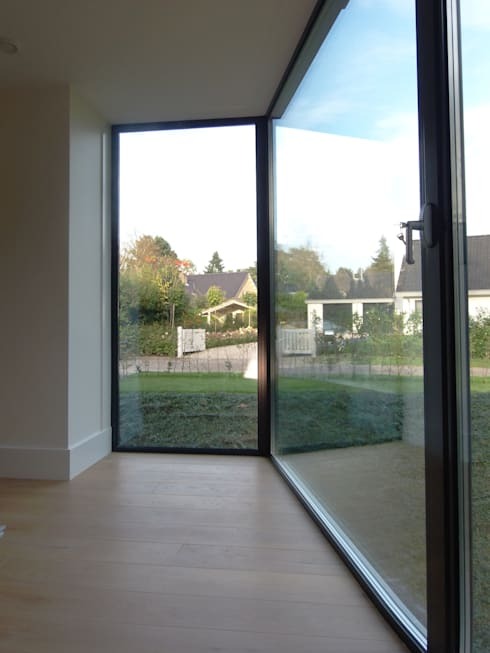 You can see from here, how sleek glass windows allow the basement to receive sunlight. On this side of the villa, the different lines, angles and curves of the building become more apparent. 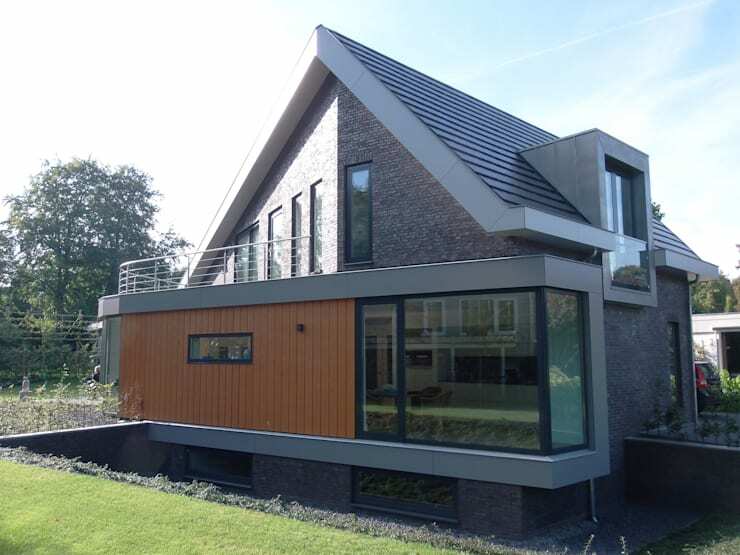 Plentiful glazing adds a modern finish to the elegant grey home, while steel and wood offer textural variety. Bold black furniture with random touches of red infuses the expansive living room with appeal and personality. The light-hued wooden floor complements the pristine white walls and ceiling, while flowers and chic lamps add style to the setting. Sliding glass doors help in merging the interiors and exteriors when left open. 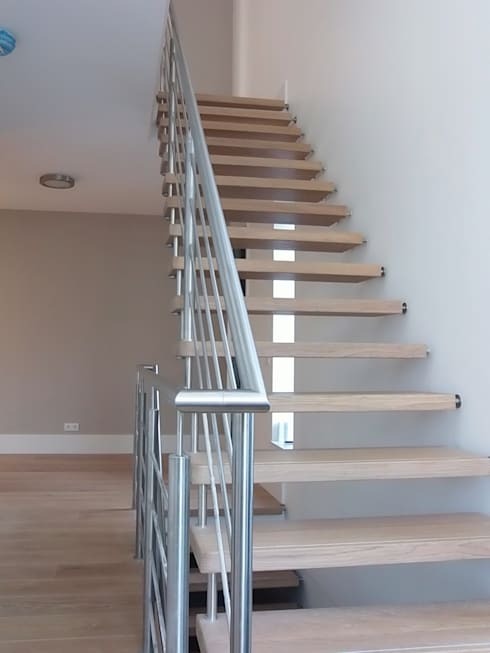 Floating wooden steps and ultramodern steel railings come together to make this staircase a smart piece of work. It’s simple, minimalistic yet very elegant and goes well with the white environs. Large glass windows set in sleek black frames add a whole new edge to the villa, thanks to the gorgeous outdoor views they offer. During cold months, they keep the home warm but let you admire the greenery. And in summers, you can keep them open for an airy and refreshing indoor ambiance. Hope this modern, creative and subtly luxurious villa has inspired you by leaps and bounds. For more ideas, take another tour - Take Your Hat Off To This Beautiful Rustic Home.